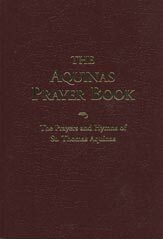 Rich with doctrinal exactitude and a moving beauty of expression, the prayers and hymns of St. Thomas Aquinas have long been considered to be among the Church's greatest treasures. Now you can bring these treasures into your own prayer life with The Aquinas Prayer Book — the first complete English language collection of these stirring prayers. 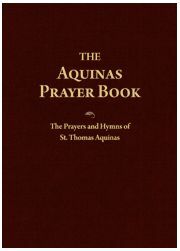 This handy and beautiful leatherette volume brings you all of St. Thomas's known prayers and hymns in their Latin originals, along with new English translations. 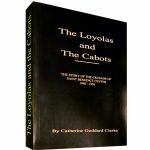 These translations render the originals with superb precision and a soul-fortifying eloquence that rivals St. Thomas's own masterly use of Latin. A number of these prayers have never before been translated into English. Prayer and praise . . . for all times and occasions These works are not meant just to be read, but to be prayed. 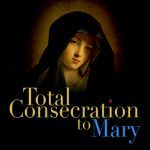 After all, these are the prayers that St. Thomas himself used to bring radiant order to his own spiritual life — upon rising, before setting to work, during periods of meditation, before Confession and Holy Communion, and even as he received the Last Rites. Their subjects are as varied as your own daily spiritual needs. Each one will deepen your faith, enlighten your understanding, and lift your heart to God. Two respected Catholic men of letters collaborated to make this unique collection possible: Robert Anderson, an Aquinas expert and professor of philosophy, and Catholic poet Johann Moser, whose own poems have been acclaimed by Russell Kirk, Thomas Howard, Fr. George Rutler, and others. Together, these men have produced a work remarkable for its accuracy, its beauty, and, above all, for its profound spirituality. Now you, too, can pray those prayers that helped make St. Thomas Aquinas one of the Church's most renowned and revered saints. And others, each a glorious taste of Heaven!